The days of laying in my child’s bed trying to get the little f-cker to sleep are long gone. Instead, she lays in her bed watching Good Luck Charlie until her eyes pop out. Dr. said that my children needed less sleep and it was natural – FOR WHOM!!>? He said they would probably be smarter because they would have received more stimulus – SO WHAT!! I wanted them to be dumbarse kids who slept! I needed my sleep…..this post and book speak to me even after all these years….thanks for sharing! Amen sister. 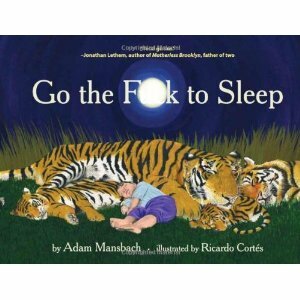 Have not read the book, finally passed the stage also….could have used it during my decade of hell sleep. Seriously – and let me be the one to tell you the sleeping issues can last a loooooooooong time! I just peed myself–hysterical. Anyway, I’m such a sh*tty parent. I just left ’em upstairs screaming and put in my iPod. I mean, if they’re fed, watered, their little butts are clean, you’ve read fifty books, and all the scary monsters have been blessed away, what else the hell are you supposed to do? They’ll get sick of screaming and go to sleep eventually, right? RIGHT?!@#!? Bedtime really is a tough cross to bear – I hate hearing about those kids who fall asleep before their head hits the pillow, life’s just not fair.